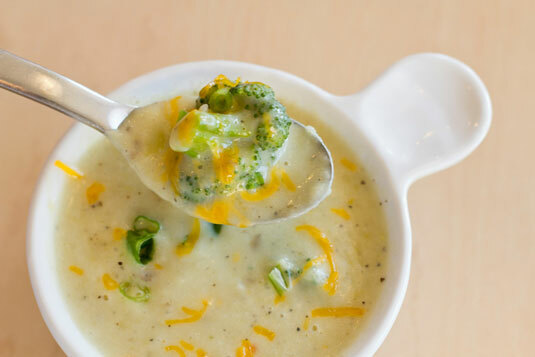 This soup is a crowd pleaser and a good fit for most ages and tastes and can help make a great meal after your successful weight loss surgery. Make a double batch and enjoy for a few meals throughout the week. In a large soup pot, add the shallot and butter on medium heat. Stir until softened. Add the broccoli, stock, salt, and potato. Simmer 15 minutes or so until broccoli softens. Turn off the heat and add the milk. With a handheld blender, blend until smooth. Stir in the cheese with a wooden spoon or spatula until melted. Per serving: Calories 150 (From Fat 41); Fat 5g (Saturated 3g); Cholesterol 11mg; Sodium 773mg; Carbohydrate 20g (Dietary Fiber 4g); Protein 10g; Sugar 4g.